Exquisitely designed, these attractive Colonial Shutters provide the durability to withstand hurricane force winds while enhancing the architectural features of a home. Colonial Shutters swing to close and can be secured from the interior or exterior of the home to discourage unauthorized entry and vandalism. Colonial Shutters are an excellent choice for someone who wants to provide quality hurricane protection for their home without obstructing their view. OurColonial Shutters have an “Island Appeal”. The simplified design of the panels provide effective security and weather protection. They can be left open for an unobstructed view and stack evenly to each side of the window, giving the ability to match any exterior decor. 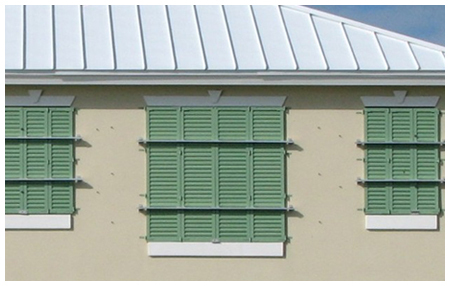 The Colonial Shutters meet the Dade County Building Codes (the highest standard in the nation), the Florida Building Codes, and the High Velocity Wind Zone codes.